Kgalagadi Transfrontier Park - Part 1, May/June 2014 Hoedspruit to Augrabies Falls National Park. This years winter break saw my wife and I travelling from the Lowveld of Hoedspruit in Limpopo located in South Africa's far North East, to the Kgalagadi Transfrontier Park in the Northern Cape, located in South Africa's far North West. It would take us on a journey of discovery and 3200km (nearly 2000miles) round trip in just 10 days. Both my wife and I were excited as this would be our first trip to the Kgalagadi Transfrontier Park one of South Africa's few 'arid' parks and a totally new experience for us both, as the Kgalagadi Transfrontier Park is probably one of the the last true 'wilderness' locations left in South Africa and indeed a far cry from the 'bush' of the Lowveld and the Kruger National Park. However, before we actually got to the Kgalagadi Transfrontier Park we decided to take a couple of days out and make a few detours, as we were travelling all that way. With the car packed to the hilt with photographic equipment, warm clothing (as temperatures can get well below zero in the Kgalagadi) and food supplies, including 30 litres of fresh water for the Kgalagadi Transfrontier Park leg of the journey, we set off in bright glorious winter sunshine at midday on the 29th May from a place called 'Bronkhorstspruit' near Pretoria in Gauteng on the first leg of our trip. We travelled the rest of that day some 500km (just a little over 300 miles) to our overnight stop at a small lodge on the road called Klondike Lodge on the outskirts of a small town called 'Vryburg' in South Africa's North West Province, but still a long way from our ultimate goal of the Kgalagadi Transfrontier Park. The next day saw us up reasonably bright and early and ready to leave after breakfast at about 7-30am as the sun barely rises above the horizon before 7am in the winter months in South Africa (June-August) and we had a further 500km (again just a little over 300 miles) or so to travel that day to our next destination which was 'Augrabies Falls National Park'. The sun shone and the road was good and reasonably clear as we continued our journey through to the Northern Cape, we noticed a distinct change in some bird life as we travelled into the Northern Cape after leaving 'Vryburg' and we swapped the menacing looking 'Pied Crows' (Corvus albus) and their 'messy' stick nests on the telegraph poles which had been following us since we had left Gauteng the previous day, for the huge and orderly 'communal' nests of the 'Sociable Weaver' (Philetairus socius). 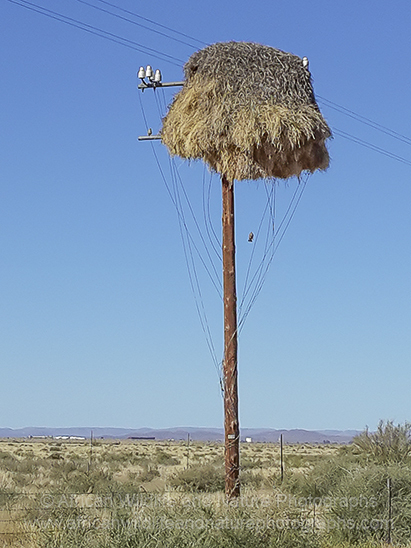 These nests are perhaps the most spectacular structure built by any bird. We will continue our journey with you in next weeks blog post as we arrive at the 'Augrabies Falls National Park' and onward to our first day in the Kgalagadi Transfrontier Park at the Kalahari Tented Camp where we were to spend our first days and nights in the park.